An inherent challenge for all early stage startups is deciding whether to focus on growth or product/market fit. It’s a false choice, as Rob Go wrote in a post about this conflict. They both matter. Years ago, I had two very positive but very different customer interactions that demonstrated the types of conversations that can help you focus on both. Plenty has been written about “getting out of the building” to talk to users and potential customers. It’s a great way to focus on product/market fit. So I’ll focus on the type of conversation that can reveal opportunities for growth. Let’s call it scrutiny. Subjecting your software to scrutiny is not about talking to the users who hit the sweet spot of your product/market fit. You know the ones who love your app, have a few suggestions, but aren’t pushing its limits much. Scrutiny means talking to people that challenge your vision and your knowledge of your product’s functionality and use cases. The first conversation I had was with a Software-as-a-Service (SaaS) company whose use case is right in the sweet spot of what Intercom does. I was able to help them understand higher level uses, get deeper into the potential of Intercom for their business and move them toward becoming power users through best practices. It felt good. It confirmed how well I knew our product and how it helps customers make their web business personal. But there wasn’t much scrutiny. The second conversation was with a user who was not exactly in our sweet spot. They are a SaaS company, but their market is outside the tech world. Their customers are not developers or especially web savvy. They are trying to take a job that was previously done mostly with “paper, emailed pictures, Microsoft documents and a lot of printer ink” and do it in a SaaS model. In other words it wasn’t skepticism. I didn’t have to sell to them. It was scrutiny. Still, the conversation did not flow easily. There were times I struggled to understand the use case. My knowledge of Intercom was being pushed, prodded and tested. But the great thing was, it was not oppositional. Along with the tough questions came satisfaction and praise as together we uncovered ways Intercom fit their purposes that surprised us both. 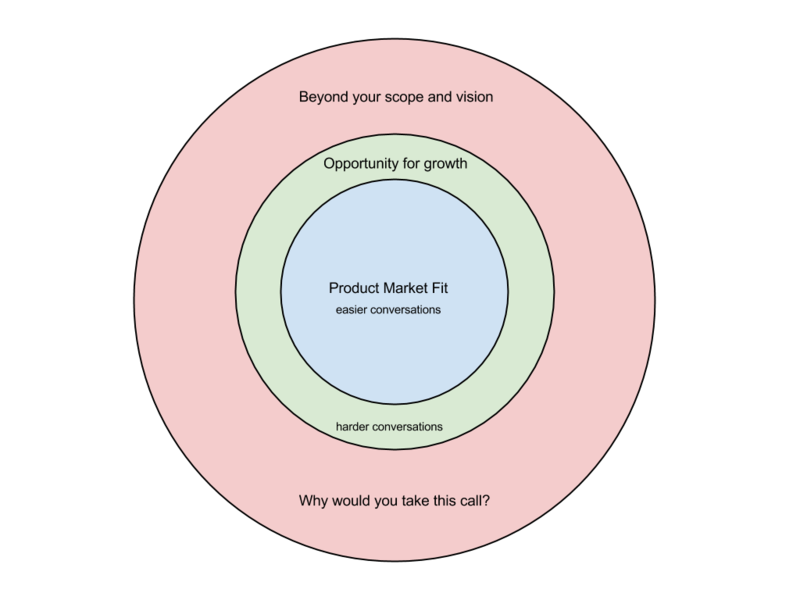 The pointed questions helped me explain how to use Intercom in a way I might not have if they hadn’t asked them because they are not serving a traditional SaaS or even web-based market. Another great question they asked was “What are the limitations of Intercom?”. If you are building and selling something, whether it’s software or a tractor, you will be asked this question. If you can’t identify your limits confidently, you have a problem. Either you’re scared to admit them (why?) or you’re just afraid to say no to a customer. It is important to say no when managing a product. But to do that you need to understand why you are saying no to certain features or functionality. You can’t build everything, and great customers appreciate that. They just want to be clear on your limits. The follow on question is usually “Why don’t you do that?” This shines a spotlight on parts of your product that you probably don’t talk about much. Is this limitation the result of a bug that you’re constantly making excuses for? Is it some half-finished feature? If so, why have you not built it out or killed it to help maintain product focus? Is it a feature you know you should build but haven’t yet? Being asked this question by a customer scrutinizing your product highlights areas for improvement and underscores product decisions you have or have not made. Productive scrutiny will inevitably lead you to a place where your only answer is “I don’t know.” This is another great opportunity for reflection. Why don’t you know? Is it an area of your product you don’t understand as well as you should? Is it a use case you haven’t considered? If so, looking with this fresh perspective may uncover a new feature that aligns well with your vision, an area you should research more, or a reaffirmation of why you don’t build that feature. Difficult conversations shed light on areas of your product with questions that your typical customer is not asking. They can help reveal a previously unrecognized opportunity that fits with your vision. So that when it’s time to say yes to a new feature, you understand exactly why. Finally, while scrutiny pushes your boundaries, there’s a flip side. It’s an opportunity to challenge your customer to push the boundaries of what your app can do. If it goes well, you’ll have a great new use case to share with other users. Someone willing to take time to experiment and stretch the capabilities of your product can be very valuable. Someone with an outside perspective of your product won’t have the same preconceptions and understandings of its limitations as you do. At Intercom we experienced this ourselves when we released our APIs. We knew we were opening up a lot of possibilities for building new things using Intercom data. At the same time, we didn’t know exactly how they would be used. So we were excited to learn one of our customers, Unbounce, had built a Zendesk widget that links to the ticket requester’s Intercom profile and displays their name, custom attributes, segments, and tags. Another customer used our Conversations API to build a Chrome extension that adds priorities to conversations in their Team Inbox, and a dashboard to track their conversation activity and response times. Innovation like this is driven by need, and it’s impossible to anticipate every use case. So provide your customers the opportunity and the tools then let them teach you a bit about your own product. Bonus: Formal engineering challenges can be a great way to recruit. As software eats the world there are growing opportunities to build for new markets. There are huge markets in industries that are beginning to move to the web. A little bit of scrutiny, especially from someone outside your products “sweet spot” will offer a perspective you don’t have because you’re in the middle of it. By challenging your own assumptions and understandings, scrutiny helps you balance working on product market fit with discovering ways to grow that market. So seek out scrutiny. Invite users to push your app’s boundaries. And if you’re lucky enough to have a customer who lets you know they intend to ask some hard questions, jump at the chance to take that call.